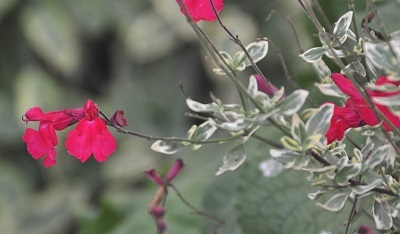 Variegated Autumn Sage is a highly variegated small shrub that lights up any dark corner. It looks great planted with Creeping Golden Marjoram which is golden-green in early spring. Cut off any green stems which might make an appearance. This plant is sometimes available in plug trays. These trays hold 128 of all the same plant. They are a great low cost way to fill a lot of space. Each cell is 3/4 of inch by an inch. Check here to see if Variegated Autumn Sage Plug Trays are available.